Interstation Flexo Dryers dramatically increase productivity, allow you to provide higher quality graphics options and expand the capability of your flexo operation. Drying each or selected colors eliminates ghosting and optimizes color trapping providing dramatic increases in productivity and product value. Final Flexo Dryers provide additional increases in productivity and quality by ensuring full drying prior to inline die-cutting. This essentially eliminates the potential for tracking, smearing and offsetting from sheet to anvil cover, even with inline varnishing and full coverage printing. In almost every instance the use of dryers eliminates the need for multiple passes. Printing, varnishing and die-cutting can be done in a single pass, not two or three. Drying also greatly maximizes the ability to use high holdout materials like clay coated, high-graphics sheets without compromising run speeds. The spot zone cassette design offers maximum efficiency for operation and maintenance. Efficient. Adjust energy levels of individual cassettes for optimum drying. Turn off cassettes not in use for maximum efficiency. Maintenance couldn’t be simpler. Turn the latch, lift and slide out. It’s just that easy. 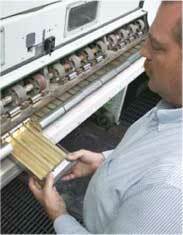 The zoned cassette designs allow individual cassettes to be quickly removed for maintenance or replacement. Safety. Our unique cassette design virtually eliminates the risk of fire that is common with other infrared drying systems. 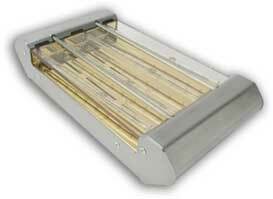 Special glass protective plates and sheet guides protect the lamps from damage through warped board or loose fragments. Each cassette is designed with air sweep apertures powered by internal fans. Air is forced into the cassette creating a positive pressure environment to remove moisture and minimize the paper dust and other contaminates that can enter and collect inside the cassette chamber. The air exits the chamber through integrated air knives positioned to agitate and accelerate the vacuum transfer exhaust of the moisture-laden air that is trapped at the sheet surface. Intense infrared energy offers the ultimate in drying efficiency. Gold plated reflector for maximum efficiency. 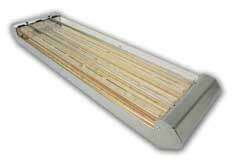 Lamp position promotes even drying and maximum dwell time. Variable and spot zone drying control maximizes efficiency and reduces energy costs. Configurations for close coupled top and bottom, as well as high board line fixed frame designs. Quick release cassettes for fast, simple and trouble free maintenance that does not impede production. ADS – Automatic Dryer Settings reduces set-up time by automatically calculating and initializing drying zones to match printing dimensions. Job storage and recall for quick set-ups of repeat orders. Lamp test utility identifies lamp faults on screen. Enhanced productivity – multi-color printing, varnishing and die cutting in a single pass. Increased efficiency – allows jobs to run at optimum speed. Trapping of color in line. Superb finish quality adds luster and protection. Added value – open up the world of creativity to your designers and your customers. Elimination of ink build-up and marking from anvil covers and belts.